PPIs can relieve symptoms that are causing you discomfort, or prevent stomach injuries from the irritation acid can cause, allowing you to heal more quickly. If you think PPIs would help to treat your problem, speak to one of our doctors today by booking a video appointment on your smartphone, tablet or desktop computer. Our doctors can listen to your symptoms and write you a private prescription that you can pick from a pharmacy of your choice, allowing you quick and easy access to the medication you need. Proton pump inhibitors help to limit the amount of acid produced in your stomach. As part of the normal digestive process, your stomach will produce acid that helps to break down food and kill off any bacteria. To protect itself from the affects of the acid, your stomach is tightly sealed off from your throat and is lined with a natural mucous that prevents corrosion. However, in some people, this lining can break down - letting the acid eat away at the stomach, leading to an ulcer. 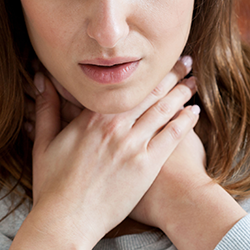 In others, the muscle responsible for keeping the throat and stomach separate (the sphincter) can develop a fault that lets acid through, which irritates the oesophagus. Proton pump inhibitors act on the chemical system that enables cells to create stomach acid, giving ulcers time to heal and preventing heartburn.